Many veterans in Texas want a safer alternative to harmful prescription medicine, which can lead to addiction to narcotics and an alarming number of overdose deaths every year. If you are like the thousands of Texas veterans who take cannabis to relieve the symptoms of post-traumatic stress (PTSD), traumatic brain injury (TBI), chronic pain, or other service-related injuries, you are treated like a criminal in Texas. That is wrong, and your voice should be heard. Texans for Responsible Marijuana Policy wants to send a message to state lawmakers that it’s time for a better option, and you can help. We have launched a one-year project to collect a single used prescription bottle from every state veteran who wants a safer alternative. We have launched a one-year project to collect a single used prescription bottle from every state veteran who wants a safer alternative. 1. Locate an empty bottle (one per veteran). 2. Remove the label and clean the bottle. 4. Place it in the bottle! 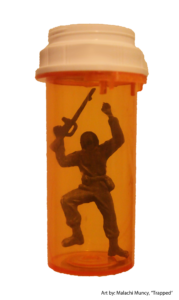 Texas NORML will add a toy soldier to each pill bottle received. Texas Veterans, please sign this Letter to Governor Abbott. We will deliver your electronic and in person signatures to his office on Veterans Day, November 11, 2016 after participating in the Austin Veteran’s Day Parade and holding our Operation Trapped Press Conference. We ask every veteran, family member of a veteran and citizen who supports veterans in Texas who believes that we need a medical cannabis program in our state to write a letter to Lieutenant Governor Dan Patrick, the President of the Texas Senate. 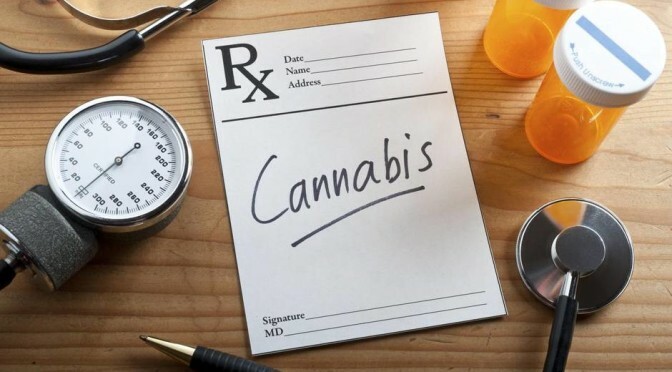 Please ask Lieutenant Governor Patrick to give us our day to discuss medical marijuana and authorize Senator Campbell and the Senate Veterans Affairs Committee to hold a fact-finding hearing about medical cannabis and Texas veterans. We want our Texas veterans to appear before the members of our Veterans Affairs Committee and tell them how cannabis has saved and transformed our lives. This letter was written by David Bass, Director of Veterans Outreach for Texas NORML. Click here for a letter template that you can use. 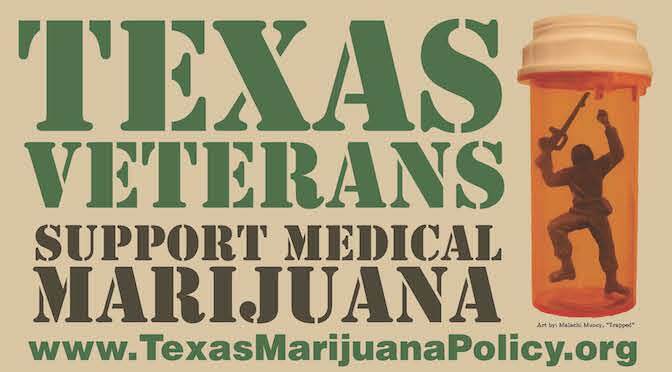 Simply ask Lieutenant Governor Patrick to authorize a Senate hearing reference medical cannabis for veterans and tell him why you personally support a medical cannabis program in Texas. On Veterans Day, November 11, 2016, we will hold a press conference and present your bottle along with the thousands of others we will collect over the next year. We are requesting that Governor Abbot meet with a veteran from each conflict going back to the Korean War. Texas veterans should not be treated like criminals simply for treating a disability they received for defending this country. They are entitled to educate legislators about cannabis and encourage our state to adopt a comprehensive medical marijuana program. Texas shouldn’t wait any longer to offer a workable, compassionate program that benefits all in our state. You can find the event page for Operation Trapped HERE.